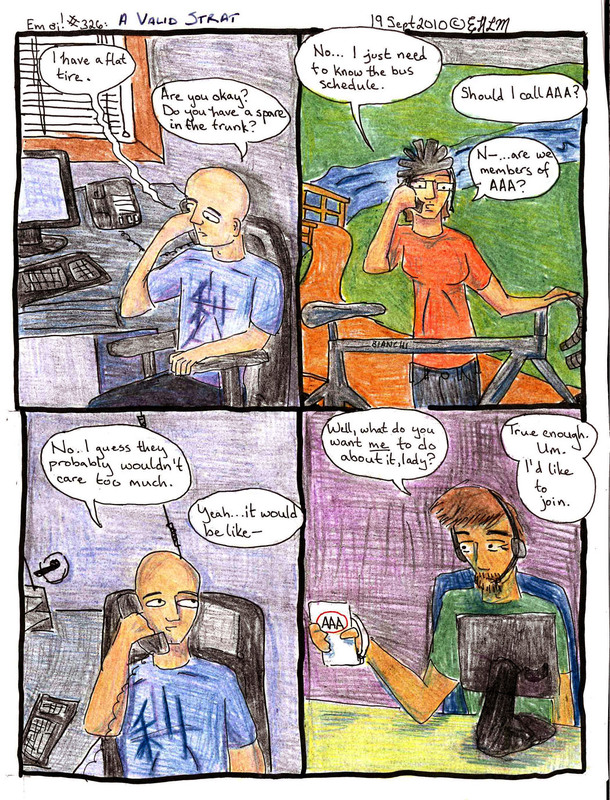 This comic gets filed under RC567.5 L86 2010 for Internal medicine–Neurosciences. Biological psychiatry. Neuropsychiatry–Psychiatry–Psychiatric aspects of personality and behavior condition–Drug abuse. 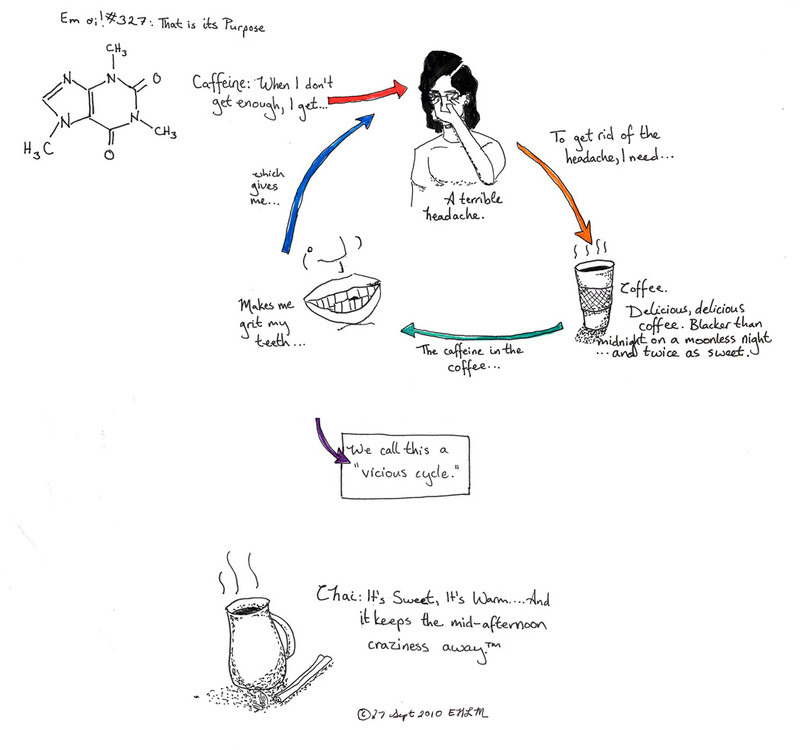 Substance abuse–Caffeine. I was trying to figure out a way to do the 5k this year. It just isn’t going to happen. The good news is, I went for my first run in two weeks yesterday (and my second today) and my foot seems to be behaving itself. I really like this one, art-wise. As I mentioned on Facebook, I won’t be doing a marathon this season, or at least not an official one. My PT guy has diagnosed me with a depressed cuboid bone and told me to stay off running for two weeks, then follow a slow program of building back up to running 30 minutes at a time for another two weeks. Given where my training is, there’s no way I can be ready for even the Middleton Marathon at the end of October, and that’s pretty much the end of the season, marathon-wise. So I guess I’ll train hard over the winter and come back fighting at the Mad City 50k or the Madison Marathon or something. We’ll see how it goes. This comic is filed under RC1220.R8 L86 2010, for Internal Medicine—Special situations and conditions—Sports medicine—Medical and physiological aspects of special activities. By activity, A-Z—Running. This is much the same classification as last week (last week was RC1220.M35), but since shin splints are common to more than just marathon runners, I thought this was more appropriate. Yesterday I did 7.3 mi, and the upshot is I need to keep taking time off until my foot is completely better. I’m really upset about this, but there’s nothing to be done but wait. I keep telling myself that I may yet make it to the marathon (though I probably won’t be BQing (i.e., Qualifying for the Boston marathon) – I haven’t run farther than 15 miles in one go in several weeks), and I can always run 26 miles any day I want to when my foot allows it. But somehow that doesn’t make me feel much better. In the meantime I’ve been biking, both on my regular bike and the spinning bike at the gym, which helps for calorie burn (a little), but just doesn’t make me happy the way running does. So it’s rough. I have to continue taking this one day at a time, which for someone who plans things like I do is painful. My foot aches when the weather changes, makes strange clicking noises when I go down stairs, and sometimes feels better…only to start hurting again when I’ve gotten my hopes up. Intellectually I know it’s just one marathon and there will be others…but I haven’t really come to terms with it yet. 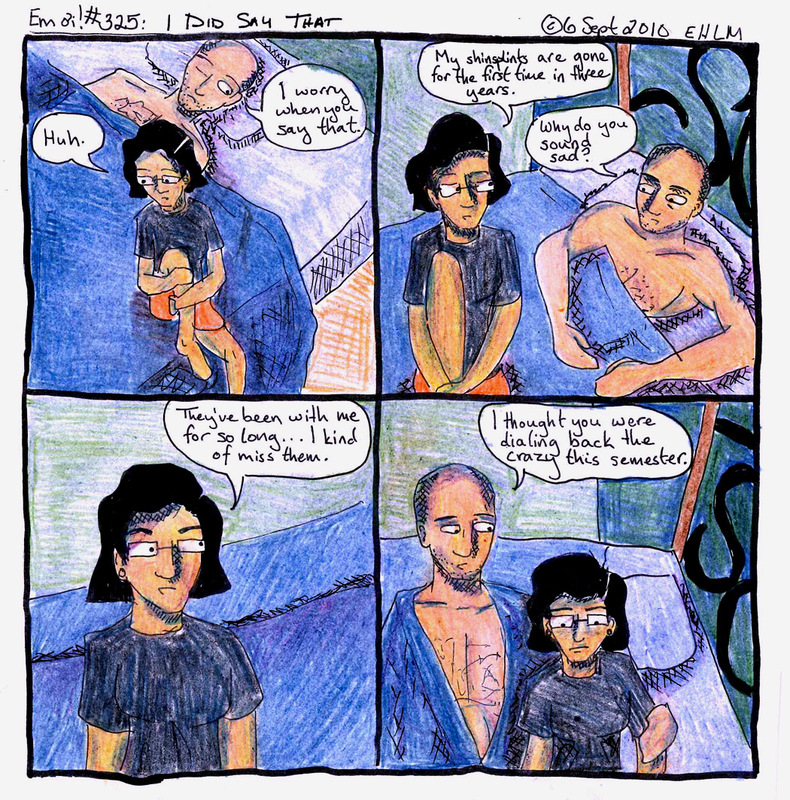 This comic is filed under RC1220.M35 L86 2010, for Internal medicine — Special situations and conditions — Sports medicine — Medical and physiological aspects of special activities. By activity, A-Z — Marathon running.